Mohd. Fairuz Abdul Halim (left) from the Ministry presenting LCCF certificate to Alias Baharudin from RMN at Wisma Pertahanan, Friday. 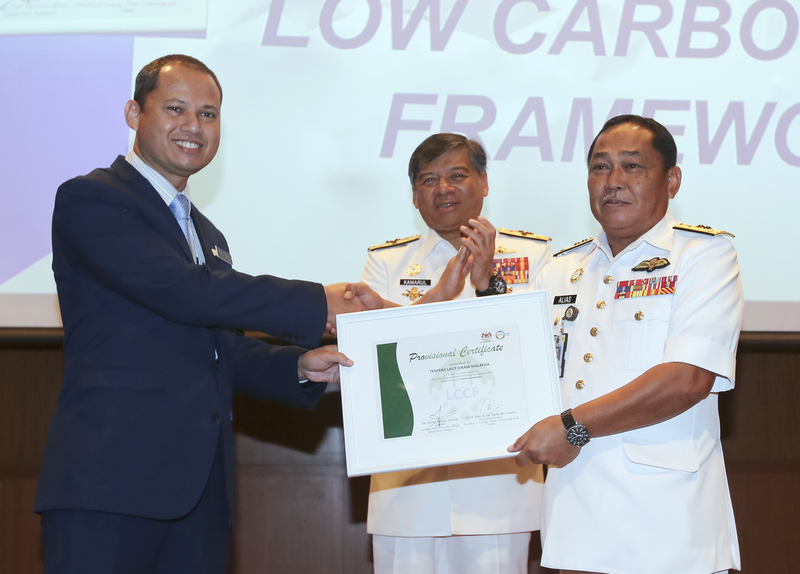 KUALA LUMPUR: The Royal Malaysian Navy (RMN) Base in Lumut, Perak has been awarded the Provisional Certificate Low Carbon City Framework (LCCF) by the Ministry of Energy, Science Technology, Environment and Climate Change on Friday in line with the Green Navy Plan 2018-2030. Chief of RMN, Admiral Tan Sri Ahmad Kamarulzaman Ahmad Badaruddin said, the award is a symbolic commitment of RMN to reduce carbon or green gas house at the Lumut Base. Ahmad Kamarulzaman said that in his speech in conjunction with the RMN Innovation Day 2018 at the Wisma Pertahanan, Auditorium here on Friday. The LCCF certificate was handed to RMN Lumut Base Commander, Junior Admiral Datuk Pahlawan Alias Baharudin by the ministry’s representative, Mohd. Fairuz Abdul Halim in the presence of Admiral Tan Sri Ahmad Kamarulzaman. Ahmad Kamarulzaman added, the RMN Innovation Day 2018 with the theme “Transformation Drives to Excellence” is very apt with the current development of RMN which is in the midst of implementing the Transformation Plan 15to5 that needs the staff to be very innovative and creative to achieve it. “The innovation culture should be instilled in every work process, way of thinking and combining ideas in a creative way “outside the box” that will bring to the success of RMN,”he said. Meanwhile RMN also receives the recognition of Malaysian Administrative Modernization and Management Planning Unit (MAMPU) that awards the Certificate of Conducive Public Sector Ecosystem (EKSA) to the Submarine Headquarters and the “Land Mine War” that had passed with excellence in the audit implemented by MAMPU on 12th and March 13th 2018. Ahmad Kamarulzaman also said that the Submarine Headquarters was awarded as the best headquarters 2018. The award was handed by Ahmad Kamalruzaman to Submarine Commander, Rear Admiral Datuk Zulhelmy Ithnain.